To specify a page background color for your document, choose Layout | Page Background (CTRL+J) to open the Options dialog to the Background page. Solid Choose this option and a color from the selector to specify any uniform color as the page background. Click Other in the color selector to use a color picker in different color models (RGB, CMYK, and so on), a mixer, or a specific color palette. Once a color has been chosen, the page background is set to that color, but the bleed area and the workspace are not. Bitmap Choose this option to use a bitmap as the page background. Click the Browse button to open the CorelDRAW Import dialog, and locate and choose a bitmap. Background bitmaps are tiled as many times as needed to fill the page. You can also scale the number of repeating tiles by clicking the Custom Size radio button and entering values. The best bitmaps to use for patterns are ones that have been designed to tile seamlessly. In Figure 3, you can see an application of a Background Bitmap that is muted in tone (and therefore is suitable for white headline text) and that was designed to seamlessly repeat. The Bitmap option is terrific for creating several different signs or stationery that contain different text but must be tied together in a theme. You might, for example, create different text on layers such as “Swimsuit Sale,” “Vacation Sale,” and “Inflatable Theme Toy Sale,” and then print different signs by hiding all but one layer for printing. You can’t accidentally move the Background, and this technique is quick to set up when you have 12 different messages that need a common background. Figure 3. Use a bitmap as a Background for your design and text. Source The Source options let you establish an external link to the bitmap file or store a copy of it internally with your CorelDRAW X5 document file. Choose Linked to maintain an external link or Embedded to store the bitmap with your document. While Linked is selected, the file path to the bitmap is displayed, and the bitmap itself must be available to CorelDRAW during printing. This option is very useful when you need to conserve on saved CorelDRAW file sizes; additionally, you can modify the background bitmap in PHOTO-PAINT or Painter, and then reload the edited bitmap in the future. Bitmap Size This field contains “either/or” radio buttons. If you choose Default Size, the background appears on the page because the bitmap’s original dimensions allow it to tile as many times as needed to fill the page. However, if you want a smaller bitmap as the background (more tiles), click the Custom Size button. The Maintain Aspect Ratio option is checked by default; you probably don’t want the bitmap background to look smooshed or stretched—with Maintain Aspect Ratio turned on, all you need to do is enter one value in either the H or V field, and CorelDRAW automatically fills in the remaining field. Note that bitmaps are resolution dependent, unlike vector drawings. Thus, you can usually scale down a bitmap, but don’t try to enlarge it, because the bitmap will go through something called resampling, and blurriness is often the result. Scale down = yes; scale up = no. Print And Export Background Use this option to control whether the page background you’ve added to your document page is included when exporting your drawing files or when you print the document. It’s available when either Solid or Bitmap is selected for the page background; by default, it’s active. The property bar is used to set up the basic page and paper sizes and orientation. But designers often need to lay out designs for items such as labels, booklets, tent cards, and greeting cards that are printed on standard size paper, but that are definitely not laid out like a single-page flyer. So you don’t have to sit at your workstation all day folding paper to try to figure out exactly where the fold lines are and where the text needs to be upside down. 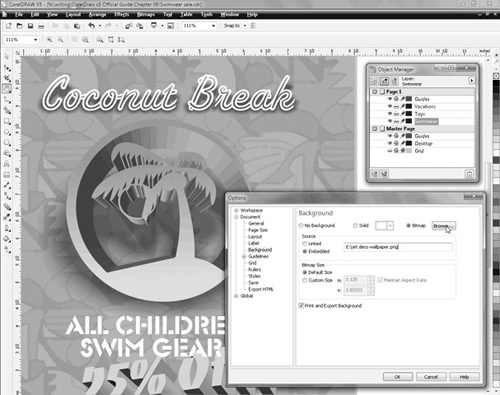 CorelDRAW X5 provides specialized layouts that are just a few clicks away. These timesavers are not on the property bar—you need to open the Options dialog to choose the one you want from the Layout drop-down box. 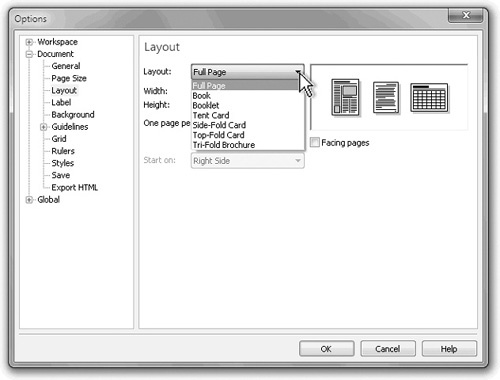 On the Layout page of the Options dialog, you can choose from seven specialized layouts for your document including Full Page, Book, Booklet, Tent Card, Side-Fold Card, Top-Fold Card, and Tri-Fold Brochure. Choosing one of these layout styles instantly divides the current document page size into horizontal and vertical pages, based on the preview supplied in the dialog. Full Page This layout style is the default for all new documents, and it formats your document in single pages, like those shown here. 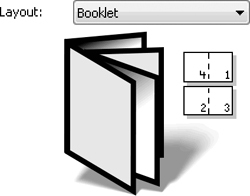 Book The Book layout format, shown right, divides your document page size into two equal vertical portions, and each portion is considered a separate page. When printed, each page is output as a separate page. Booklet In a similar arrangement to the Book layout, the Booklet layout format divides your document page size into two equal vertical portions. Each portion is considered a separate page. However, when printed, pages are paired according to typical imposition formatting, where pages are matched according to their final position in the booklet layout. In a four-page booklet, this means page 1 is matched with page 4, and page 2 is matched with page 3, as shown at right. Tent Card The Tent Card layout format, shown at right, divides your document page size into two equal horizontal portions, each of which is considered a separate page. 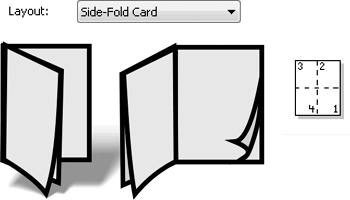 Because tent card output is folded in the center, each of your document pages is printed in sequence and positioned to appear upright after folding. Side-Fold Card The Side-Fold layout format divides your document page size into four equal parts, vertically and horizontally. When printed, each document page is printed in sequence, and positioned and rotated to fit the final folded layout. Folding the printed page vertically, then horizontally, results in the correct sequence and orientation. Top-Fold Card Like the Side-Fold layout, the Top-Fold layout format also divides your document page size into four equal parts, vertically and horizontally. When printed, each document page is printed in sequence, and positioned and rotated to fit the final folded layout. 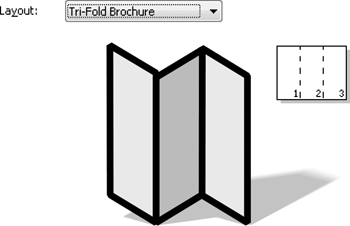 Tri-Fold Brochure Set your page orientation to Landscape using File | Print Setup, and you then have the ideal layout for travel brochures and restaurant tabletop stand-up menus. If your printer supports it, you can print both sides for a total of six panels, with live space measuring about 3 ½″ wide and 8″ high on the end panels. After you choose a layout style and return to your document, each subdivision of the layout can be viewed individually. You can also view pages in pairs by choosing the Facing Pages option in the Layout page of the Options dialog for several layout styles. When Facing Pages is selected in the dialog, you also have the opportunity to start your document on either the Left Side or Right Side for some layout styles by making a selection from the Start On menu. 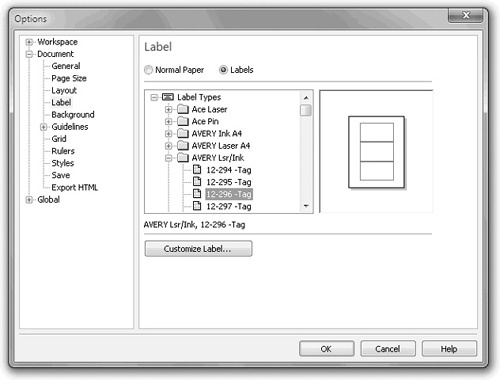 CorelDRAW has a comprehensive collection of label formats for preformatted paper stock from vendors such as Avery, Ace, and Leitz. Once you’ve clicked the Labels radio button, the Page Size page turns into the Label page, offering access to the label collection. After you’ve selected a specific label format, the preview window shows its general layout and indicates the number of rows and columns available, as shown in Figure 4. Figure 4. 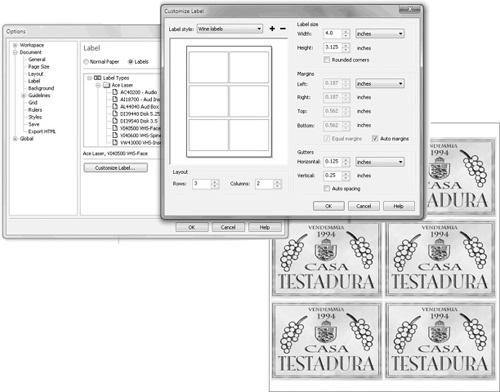 CorelDRAW has just the preformatted label template you need. After you choose a label format and return to your document, each of your document pages will represent an individual label. You’ll need to add the exact number of pages to accommodate all of your labels. If you don’t see the exact manufacturer for your specific label type, you can create your own from scratch, or base it on an existing label format (see Figure 5). Choose an existing label from the Label Types menu; click Customize Label; set the number of Rows and Columns; and set the Label Size, Margins, and Gutters according to your own label sheet. Once the format is created, you may save your label by clicking the plus (+) button next to the Label Style drop-down list. You can delete a selected label format from the list by clicking the minus (–) button. Figure 5. If you don’t find the label you need, modify an existing label using the options.